Are protection filters a way to help protect your investment, or simply a compromise to image quality? This week I tell the story of my Canon 70-200 f/4 L lens and its sudden introduction to hard pavement. The photo here is what's left of my Hoya HMC Sky 1A filter that I keep on the lens. Click on the photo to see how my zoom lens looks after the crash, and with a little dusting off with the Rocket Blaster. You can probably guess how I feel about protection filters at this moment. If you want to hear more, listen to this week's podcast. You can also download the podcast here (24 minutes). Or better yet, subscribe to the podcast in iTunes. In addition to our fabulous sponsors, we have affiliate agreements with Lynda.com, Amazon, and B&H Photo. If you plan on doing any shopping with these retailers, please enter their stores through the advertising boxes on this page. You'll find them in the right side columns. It doesn't cost you anything, but it can really help support this show. I laughed so hard when I read this comment about a camera falling from 3,000 feet because I had just listened to your podcast about protective filters about 4 hours ago. I agree, filters go on everything but my XTi kit lens and nifty50. My XTi has survived multiple drops due to filters AND hood! I watched my hood absorb the bounce during one such slow motion life flashing camera dropping moment as you described. I have also saved my HV30 from serious damage during an accidental tripod release that sent it to the pavement. My nice super multi coated circular polarizer took the beating, not the camera or its difficult to clean/replace lens. Filters AND hoods are a must, especially with rentals, even if you have insurance on it. I never really bothered with protection filters for any of my lenses but you certainly have me re-considering. Glad to hear you didn't lose your lens! Same thing happened to me with my 28mm-135mm lens, filter saved the lens. I tell all my students to get multicoated filters for their lenses - a small insurance to pay I think. That's also a good point about lens hoods. In addition to helping control flare, they can serve as shock absorbers. Hmmm ... a secret lynda.com title that you can't tell us about yet. Perhaps something with Aperture 3 in the title? Fingers crossed. I have ordered from Red River Paper a few times now and I use your tile - not that it gives me free shipping (not past the US-Canada border anyway). Thanks so much for the support. By using our sponsors, you're helping us keep the show on the air. As for the Lynda title, unfortunately it's not Aperture 3. Darn I wish Apple would just release it. As soon as they do, I will record a training on it. Everyone assumes the filter protected the lens. But it is an anecdotal experience and doesn't stand up to scientific scrutiny. The only way to be sure that filters do protect the lens would be to subject the lens and the lens+filter combo to the same stress and observe the outcome. It might be that the same force that would not break the lens easily breaks the filter. Another way to do the study would be to find the minimal force to break the lens alone, then attach a filter and see what happens. No one is likely to do these studies, however. Who would want to? No filter manufacturer would reveal the studies unless the filter proved to be effective. 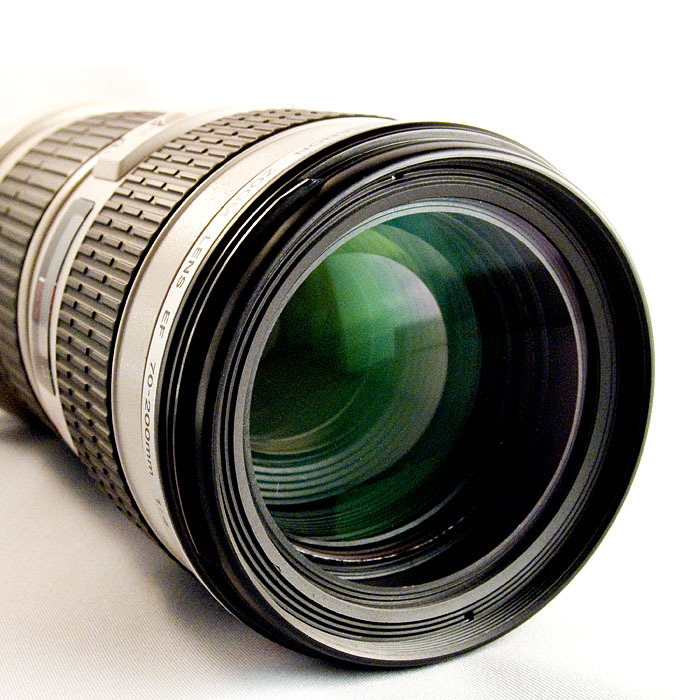 No lens manufacturer would reveal what minimal forces would destroy the lens. I doubt a true answer to this question will be forthcoming. So I only use a lens hood. Anyway I have real insurance on all my expensive lenses. And if you drop a lens it could very well be that the elements are out of alignment so the lens should go into a repairshop anyway. And having the front element replaced is not all that expensive.